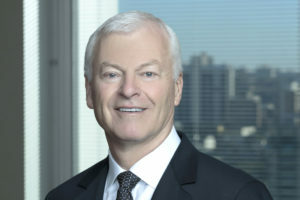 Paul Costello, the founding chief executive of the $160 billion Future Fund, has celebrated his survival from lung, brain and liver cancer with a fund-raising effort for the Peter MacCallum Cancer Centre in Melbourne on August 22. So far, in just two weeks of the campaign, he has raised nearly $100,000 to aid the research being done by the Centre, whose senior lung cancer specialist oncologist, Professor Ben Solomon, orchestrated a miraculous intervention with an experimental drug from the US. While he says he is living, and now enjoying, every moment of his life with his family, first, and friends, thanks largely to Professor Solomon, Costello says the advancements to do with genetic research are very important to the thousands of Australians who will contract the illness every year. At an event held at the Future Fund offices, Costello told the story of his remarkable journey with his cancers. He was at death’s door in March this year, but professor Solomon had managed to locate and source an experimental drug which addressed the rare genetic factor which had caused Costello’s initial lung cancer problem. Like about 20 per cent of lung cancer sufferers, about 50 per cent of whom are likely to die within 12 months of diagnosis, Costello had never smoked. Lung cancer is the biggest killer of all cancers. At the fund-raising event, David Neal, the chief executive of the Future Fund, who Costello recruited as the fund’s initial chief investment officer in 2007, remembered the dignity and courage which he showed when, nearly six months ago, he and his loved ones thought he was about to die. It had been a journey of twists and turns, often savage, Costello told the 90-odd people at the fund-raiser at the Future Fund headquarters in Melbourne. After putting up with an annoying cough for several weeks and subsequent tests he was diagnosed with late-stage lung cancer in February last year. It was the day before his 60th birthday. He reached out to an oncologist friend in Auckland who recommended Professor Solomon at the Peter MacCallum Cancer Centre. Professor Solomon took on the case. After a year of treatments – chemotherapy, immunotherapy and radiotherapy – with the cancer having spread to his brain and then his liver, Costello and his family were preparing themselves for the end. He was in palliative care and in a lot of pain. But Professor Solomon also showed optimism through the darkest hours. He was in contact with the US pharmaceutical company, LOXO Oncology, and was trying get Costello onto a clinical trial program. Unfortunately, he was considered too ill for the program but the company gave him the drug on compassionate grounds. “Never let it be said that big pharma doesn’t have a heart,” Costello said. Despite the risks, for both the Peter MacCallum Cancer Centre and himself, he agreed to give it a go. The result was remarkable. Within days the drug had worked and he was able to function, almost normally, within a few weeks. Costello told his friends, family and industry colleagues, at the function at the Future Fund, that he realised there would be an ongoing battle between the drugs and cancer. Cancer has a tendency to evolve to counter whatever is thrown at it. “But I have had the time to prioritise my life and with this evening’s fund raising, I want to try to give something back to the people, such as Professor Solomon, who have allowed me some extra, very precious, time with my family and friends,” he said.